Have you ever experienced the heart-pounding, thought-racing, upset stomach feeling prior to competing? If you are an athlete, the answer is a resounding “YES!” That feeling is the monster named “sports performance anxiety” or pregame jitters that all athletes have experienced to some degree. If you allow the monster (anxiety about your sports performance) to run wild, it will undermine your ability to have a peak performance. If you can learn to harness sports anxiety, it can vault you to peak performance. Harnessing anxiety is the key factor that drives Olympic athletes to champions. 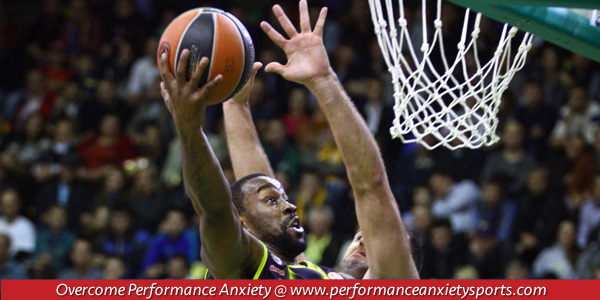 Sports performance anxiety has several effects that can cause an athlete to feel like he or she is choking, such as negative thoughts, increased respiration and heart rate, tense muscles, butterflies in stomach and/ or nausea, inability to focus and a fear of failing. Ligety was able to overcome his performance anxiety, adjust to the course conditions, and win the Gold Medal in the giant slalom. You must understand that all athletes experience an emotional response to important competitions. Successful athletes label the emotion as “nervous energy” or pregame jitters instead of anxiety and manage the emotion to their benefit. You want to embrace the fact that you feel excited and pumped up for competition, as this will help you perform better, not worse. You want develop an attitude of resiliency, the ability to adjust to a vast variety of conditions with confidence in your game. You want to focus only the moment-by-moment action of your performance and not the outcome. Outcome thinking makes you more anxious. Just like physical skills, mental skills require repetition in order to develop. All athletes seek coaches that can help them develop the necessary physical skills to hone their abilities. The very best athletes go one step further and seek sport psychologists/ mental skills coaches to improve their mental game.